Wash & cut okra into 1 cm pieces & keep it aside. Heat a pan with oil, add cumin, mustard & onion seeds, once splutter , add green chillies & onion , fry it until it turn to golden brown. Now add salt, turmeric & coconut. again fry it for a minute. Add okra, stir-fry it for couple of minutes until golden brown. Add curd,tomato, mix it. finally add coriander, cook it for 3-4 min & then remove from fire. Bring it in a serving bowl & serve it. Hi ! Kirti , Healthy recipe ...Wonderful pic . Thank U . Bhindi's are a power house of Vitamins such as Vit A , C , B 6 , high fiber and Folic acid . Rich source of Potassium , Magnesium , Calcium and Complex Carbohydrate . 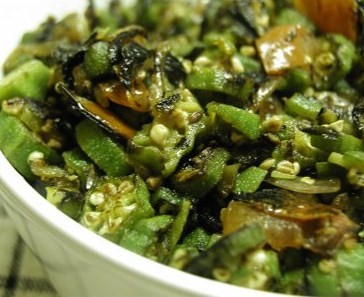 Bhindi's or Lady's finger help to stabilize blood sugar . Lowers serum cholesterol nd reduce the risk of Heart diseases . Heals Ulcer and keeps the Intestinal tract healthy . Helps to neutralize acids . Treats lung Inflammation nd sore throat . Protects the skin , Improve hair health nd Premature aging . Boosts Immune system . To retain the nutrients and self -digesting enzymes , bhindi's should be cooked as little as possible . hi Alfiya, it will ok if u don't add the onion seeds. Hi Radhika,onion seeds are nothing but kalaunji and is easily available. thanks to kirti for this recipe. what's onion seeds? i have never heard of onion seeds. Do the grocery store carry this seeds? please reply to this.